This was first published in 2009 and is referred to in Wikipedia. Curves are an integral element of design and especially of landscape, since they make a connection to nature, which does not use linear form. Curvilinear lines are notoriously difficult to achieve as they are invariably of a freeform nature (ignoring geometric curves which are formed by arcs) and are subject to interpretation “by eye” of the person setting out the design. A few centimetres either way can however, throw a curve out, disrupting its harmonic flow. As someone who designs a lot with organic, freeform curves, I have seen horrendous attempts at setting out curves by contractors who are nonetheless competent in every other respect. It’s not about ability so much as a certain way of seeing things. Perhaps drawing curves that work is the ultimate test and definition of a good designer, whilst the successful setting out of curves on the ground or in three dimensional form separates the artist from the builder. It’s easy for me to say there are good and bad curves, quite another to explain and illustrate the difference. I have been wanting to write this article for a number of years, but so far put it off because of the difficulty in describing something so abstract. However, understanding curvilinear form is crucial, so I will try to explain something that is for me instinctive, rather than intellectual. Let’s take as a starting point the difference between intellectual and instinctive design. 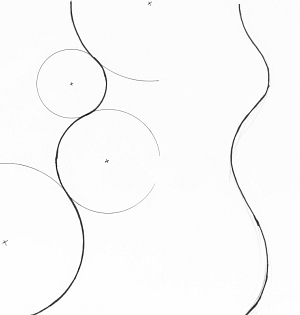 Intellectually, you might form a series of circles and form a connecting line whilst instinctively, you might just take a pencil and draw a flowing line. The former is precise, controlled, intellectual, inorganic, whilst the latter is instinctive, free-flowing, emotional, organic. This is illustrated at here: need I say which is which? The left hand curve would be preferred by any contractor setting out a garden: provided he gets the centre points in the right place, the rest is simple. the right hand curve requires personal judgment of eye; it is subjective and so much harder to translate from paper onto the ground. The right hand curve is alive; it has rhythm, flow, it feels right. The other curve simply jars the eye, it is dead, with no movement. It is true, however, that not every freeform curve is successful. In nature, animals (and Man) move in curved paths, plants follow curved movements, water flows in spiral vertical pathways. All these have a natural rhythm, and for our freeform line to succeed, it must do likewise. A centred line running through the curves with offset measurements is the best way to translate this from paper but it is still easy to get this wrong, in the manner illustrated below. The freeform line at top left shows two possibilities: the red line is smooth, flowing, but the green line flattens across the natural line of the curve. It is still a freeform line but it no longer feels fluid and loses its sense of movement. The variation from the red line might be only a matter of inches/centimetres but it is enough to disrupt the visual flow. To make matters more complicated, there is seldom just one exact freeform line that is perfect for the situation: in the drawing below left, all of the different lines will do the same job. What determines the correct one is likely to be the relationship of it to other nearby elements. Perhaps the most common mistake is to use too many tight reverse curves – to put in too many “squiggles”, in other words. On the whole, reverse freeform curves should not be too severe or exaggerated. Let’s look at how a predefined space determined the use of curvilinear form. The example at right is (part of) a beach garden I designed a some years ago. 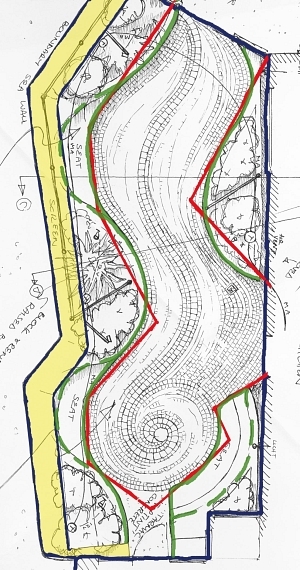 The yellow area is the boundary wall – a massive concrete sea defense wall 700mm thick. The kinks and angles in this wall left a space that provided no internal parallels and could only be fully resolved using curvilinear form. The area adjoining this (not shown) was linear in format, as the space there invited. Running all the way along the inside of this boundary wall was a seat, again of massive concrete. This needed breaking up with the introduction of planting beds, leaving small sections of seat in between. The red line represents the nearest linear form that could have been used but you can see that what it describes is naturally curvilinear in nature (the green line). Don’t forget that all curves are made up of straight lines (curvi-linear)! The design uses freeform lines to reflect the boundary wall and a spiral acts as a beginning, or end, at the point where most sitting out occurs. This is what I call a “still point”, whilst the main flow of the paving, leading to the adjacent garden, I call a “line of movement”. I do not believe that this area could have been resolved so well using linear means. The main point to note, however, it that the lines had to be freeform: geometrically derived curves would not have worked, although the contractor would have preferred them! I had to assist in the setting out, but once done, a superb job of construction was carried out. The walls were rendered with a specially textured cement based render, which was ideal for the tough coastal conditions. dealing with curvilinear form will always be more problematic than linear, or than curves set out using radii. The rewards are however, subtle and infinitely powerful if you get it right.